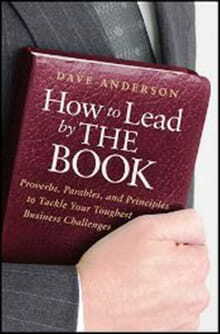 Editor's note: The following is a report on the practical applications of Dave Anderson's new book, How to Lead by THE BOOK: Proverbs, Parables, and Principles to Tackle Your Toughest Business Challenges (John Wiley & Sons, 2012). There’s a widespread lack of integrity today in both corporate ethics and the character of individual employees. But you can overcome this problem by elevating your own organization – and the people who work within it – to become the best they can be when you turn to the greatest leadership ever written: the Bible. Hold people accountable. Define and communicate specific and clear expectations for every area of people’s performance on the job. Give people honest feedback about their behavior regularly to reinforce productive behaviors and confront negative behaviors before they get out of hand. Let people know what the consequences of failing to perform well will be, and then be sure to enforce those consequences whenever necessary. Write down your organization’s expectations and post them in visible places to remind people of them often, and discuss them both publicly and in one-on-one conversations. Make sure that you, as a leader, are holding yourself to higher standards of character and competence than the standards you’ve set for others. Be the kind of role model that people can follow for successful performance on the job. Keep in mind that the more responsibility you have, the more accountability you’ll have as well. Choose the most effective leadership style: servant leadership. The greatest leader of all time – Jesus – was a servant leader. Follow His style of leadership by modeling positive attitudes, integrity, and discipline at work, and training, coaching, and mentoring others to grow to fulfill their potential. Get to know the people you work with well, and show them that you genuinely care about them. Put their needs before your own plans and priorities. Recruit great people. Your organization’s success depends on whether or not you have the right people working for you. Do your best to hire people with strong character and competency. Hire people for their heart, attitudes, and talents rather than for their skills and knowledge (which they can acquire on the job during training). Aim to recruit people who are already employed and productive, since those are the ones who the most likely to perform well on the job. Try to make your work environment appealing to top-performing people so you can attract some to switch jobs and work with you. Interview people well. Use the interview process to screen out job candidates who aren’t good performers so you can avoid unnecessarily wasting time and energy during the hiring process. Go through candidates’ resumes and applications, and knock out those who have made multiple spelling or grammatical errors on theirs. Also eliminate candidates who fail to show up on time or keep scheduled appointments, as well as those who don’t speak clearly on the phone. During interviews, focus more on people’s past accomplishments than on their past experience, since it’s their accomplishments that often predict how well they will perform in future jobs. Explain your organization’s core values and nonnegotiable expectations for employees in interviews so candidates will be fully informed. Ask them about their life histories so far and throw some unexpected questions at them; doing so will help you gauge their character from how they respond. Ask other interview questions designed to help you discern character qualities such as truthfulness, work ethic, learning and following guidance, keeping commitments, forgiveness, timeliness and ability to meet deadlines, and accepting responsibility. Be sure to pray for wisdom before hiring any candidates. Give feedback productively. Give the people who work with you specifically feedback on their job performance as quickly as you can after they’ve done something on which you’d like to comment.Talk with them about both positive and negative behaviors. Adjust the style and tone of your feedback to fit each individual to whom you’re talking. Confront poor performers. Whenever you have concerns about someone’s poor job performance, be sure to address those concerns quickly, before the person’s behavior turns into a bad habit and negatively affects your organization’s culture. Choose your battles carefully, and tell the truth in love. After sharing your concerns, follow through with warnings, instruction, and encouragement as necessary to help him or her improve. Act on your core values. Ask God to help you develop core values for your organization (what you all value most as a team), and then use them as a blueprint for making decisions and hiring and firing people. Balance your work and home life. Make your relationship with God your top priority and place it at the center of your life so you can revolve everything else around it. Then God will help you every day to balance your work and home life according to what’s best. Avoid two dangerous mistakes. Check your attitudes and behaviors daily to make sure that you’re not putting money or material things before people or having people become too dependent on you as their leader. Ask God to help you value the people you work with more than your organization’s profits, and to empower your team members so that they’re not overly dependent on you and keep growing more competent themselves as you mentor and encourage them. Create more productive behaviors in your organization. You can improve productivity in your organization by casting a bold vision that will change the culture, by hiring new employees who will inspire others with their productive behaviors, and by firing unproductive employees. Overcome the two biggest threats to your success. Watch out for sexual immorality and false teachers and their ungodly teachings. Ask God regularly to help you resist temptation to sin in those ways, which are the two most common ways that spiritual leaders fall away from God’s plans for them. Seek God’s will for your decisions. The closer you are to God, the more you can discern His will for your life. So make developing a closer relationship with God your highest priority every day. Spend lots of time regularly praying, reading the Bible, and talking with other Christians about the faith. Whenever you sense God leading you to make decisions, be sure to obey His guidance, and you will fulfill His great purposes for your life, both personally and professionally. Adapted from How to Lead by THE BOOK: Proverbs, Parables, and Principles to Tackle Your Toughest Business Challenges by Dave Anderson, copyright 2012 by Dave Anderson Corporation. Published by John Wiley & Sons, Inc., Hoboken, NJ, www.wiley.com. Dave Anderson is president of Dave Anderson's Learn to Lead, an international sales and leadership training and consulting company. Prior to beginning Learn to Lead, Dave enjoyed an extensive and successful career in the automotive retail industry. Dave has given more than 1,000 workshops and speeches over the past decade on sales and leadership development and has spoken in 14 countries. Dave is author of 12 books, including the TKO Business Series, Up Your Business, If You Don't Make Waves You'll Drown, and How to Run Your Business by THE BOOK. He authors a monthly leadership column for two national magazines and his interviews and articles have appeared in hundreds of publications including. Dave, along with his wife Rhonda, is the co-founder of the Matthew 25:35 Foundation, whose mission is to bring food, housing, clothing, healing, and ministry to under-resourced and imprisoned people worldwide. Visit Learn to Lead’s website at: http://learntolead.com/.